Schneider prides itself on its innovation and its relentless quest for a better way to do things. Our award-winning Engineering department is just one of many areas responsible for that continued effort. Having been in operations research for more than 35 years — 20 with Schneider — I can attest to the unique culture and opportunities provided here. Schneider’s engineering careers allow you to work for one of the largest operations research/logistics engineering departments in the country, enjoy the freedom to explore complex ideas that actually get implemented and get buy-in from leadership. Our CEO Chris Lofgren even comes from an operations research background. Our projects focus on determining the best ways to use data and analytics to improve processes, increase efficiencies and find the safest and most cost-effective ways to run our business. We get to build things that significantly impact not only profitability, but also people’s lives. We are in a tight freight market now and have many choices for freight. Some markets, though, don’t have enough inbound freight to get drivers home on weekends. We recently identified regions of the country where there were freight deficits on weekends and adjusted our load acceptance rules to capture more freight that is good for the drivers. These changes will improve the frequency of time at home for drivers while reducing the number of deadhead moves currently used to get them home. What Else is Engineering Working on? Design and implementation of a new optimization model to set appointments for our intermodal customers. As an engineer at Schneider, I have access to the latest software, plenty of data storage, and a supportive organization to implement results. Our TECH group is committed to high data quality, so we spend less time cleaning data and more time analyzing data. Want a job that will encourage you to be innovative? At Schneider, we pride ourselves for always trying to improve and be better. Apply for a job with us and take part in the effort. 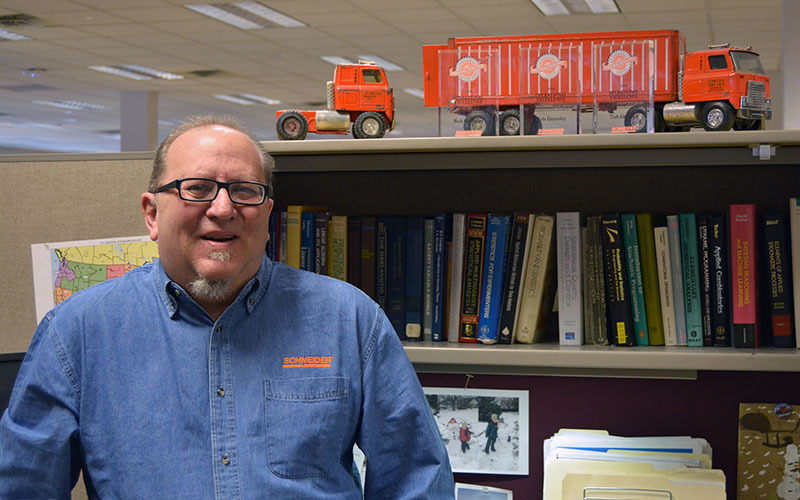 Bob, a senior engineer with Schneider, has worked in operations research since 1982. Since 2005, his work has concentrated on fleet operations, pay package design, employee recruiting and retention, pricing, purchasing, routing, revenue management, fleet sizing, and operations using a variety of operations research, predictive analysis and economic analysis techniques. Prior to 2005, he was responsible for dozens of supply chain strategy projects on a consulting basis in both manufacturing and retailing industries concerning facility location, inventory management, forecasting, and warehousing operations.